Today, I am going to focus on the “virtual directory” and it’s significance. _app_bin The _app_bin folder was designed to hold application assemblies which were previously installed in _layouts/bin. Web Part assemblies are *not* supposed to be installed in this folder. Put your assemblies in GAC or the bin, but not the _app_bin. _vti_pvt This folder is used by FrontPage Extensions/SharePoint Designer. It contains Legacy FrontPage Server Extensions files/folders. The reason for having these folders is that they provide the underlying infrastructure files for the many features SharePoint Designer provides. Bin Contains compiled assemblies (.dll files) for controls, components, or other code that you want to reference in your application. Any classes represented by code in the Bin folder are automatically referenced in your application. App_Browsers Contains browser definitions (.browser files) that ASP.NET uses to identify individual browsers and determine their capabilities. App_GlobalResources Contains resources (.resx and .resources files) that are compiled into assemblies with global scope. Resources in the App_GlobalResources folder are strongly typed and can be accessed programmatically. 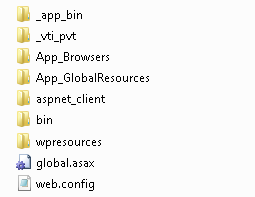 Global.asax The Global.asax file, also known as the ASP.NET application file, is an optional file that contains code for responding to application-level events raised by ASP.NET or by HttpModules. Hello Dhirendra Yadav, I'm Aaron , Thanks you share . I'm Sharepoint newbie and in my country is so less Sharepoint information .